It’s tough to build trusted relationships with members when they are spread across a state, region, or country. 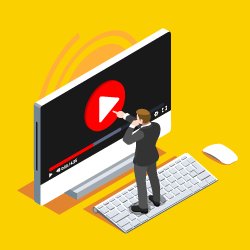 Using video is a powerful way to drive engagement, educate, and demonstrate member value and ROI – from your office to theirs. Blog like you mean it. Get the ultimate chamber blogging guide. Begin with a welcome message from your president or executive officer and move forward from there. Before you know it, you will have a video library to inform and entertain members and get the attention of prospective members. Welcome new members with a warm greeting from your organization’s president or executive officer. It will make a lasting first impression. Create a powerful message about your organization for your website, social media channels, and email campaigns. Highlight a member benefit and explain the potential value. Introduce key staff (e.g. customer service) and how they will assist members. Introduce new members by inviting them to submit a short video about their products/services. Showcase a member with a testimonial about value they’ve gotten from your organization. Promote events and education to increase attendance and sponsorships. Communicate the serious things, like legislative issues and industry news. Onboarding: Including a video in your onboarding email can double the click through rate. Video vs. Text: 59% of executives say they would rather watch a video than read text. Landing Pages: Including a video on a landing page can increase conversion rates by 80%. Comprehension: The impact of video is proven to increase customer understanding of a product or service by as much as 74%. Social Media: Social video generates 1200% more shares than text and images combined. Budget & Quality: Your chamber doesn’t need a big budget or expensive equipment to create effective videos. A mobile phone and inexpensive online video editing tools can produce great results. Length: Remember to always keep your video messages under two minutes. 33% of viewers will stop watching a video after 30 seconds, 45% by one minute, and 60% by two minutes. Non-Dues Revenue: Offer sponsorship and advertising opportunities for videos when appropriate. This gives your members/vendors valuable branding time in front of their customers and provides non-dues revenue for your organization. By 2019, global consumer internet video traffic will account for 80% of all consumer internet traffic. Is your chamber effectively leveraging this simple tactic to engage with members?